RUCKMAN MILL FARM and Studios - Bring your copy or purchase Design Basics for Rug Hookers from the author, Susan L. Feller and have it autographed. The innovative workshop on how to create a folk art pattern is now available to take home... Design in a Box, filled with templates and information about the unique American art form, frakturs. Jim Lilly will have unique cutter stands made from hardwoods and, as usual, the bold hand dyed wools and rug patterns you expect from West Virginia. Visit www.RuckmanMillFarm.com and www.Artwools.com ahead for news. Heavens To Betsy - We offer Heavens To Betsy milled wools. 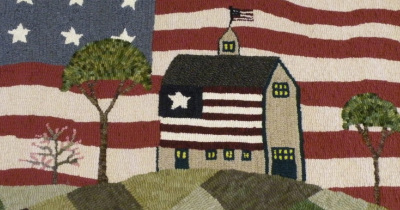 They come in a variety of textures that we have made for the rug hooking enthusiasts. We also carry a line of patterns designed by Eric Reed from Heavens To Betsy. "Rug hooking is socially acceptable because we love wool"
The Wool’n Gardener – Specializing in new hand-dyed and (the product that sets me apart) a large selection of over-dyed recycled wool. Colors range from the richest and deepest primitive palette to the soft and subtle pastels – in between are those marvelous brights!!!! The Wool’n Gardener will also be offering spot dyes, shiborhi, and marbleized wools. As always, 3/8 yard packages which include either three values or complementary wools will be available. New products being offered in 2012 include hand-dyed uncarded wool for all those mixed media pieces and the always sought-after antique paisley! Special offering for the hook-in: I am always coming up with “accidental” formulas – so, we will have a “NAME THAT COLOR” contest. I will review the entries and select a name. The winner will receive 1/2 yd of that newly named wool ($20 value)! Homespun – Original Rug Hooking patterns and kits, books, patterns from other artisans, backing fabrics, pincushions, rug hooking frames and antique sewing items. 2011 block of the month rug with patterns available at a 10% discount. “2012 Bed Rugg” design available – another year-long project feature. The show special will be – buy 2 patterns and get a 3rd at half price. 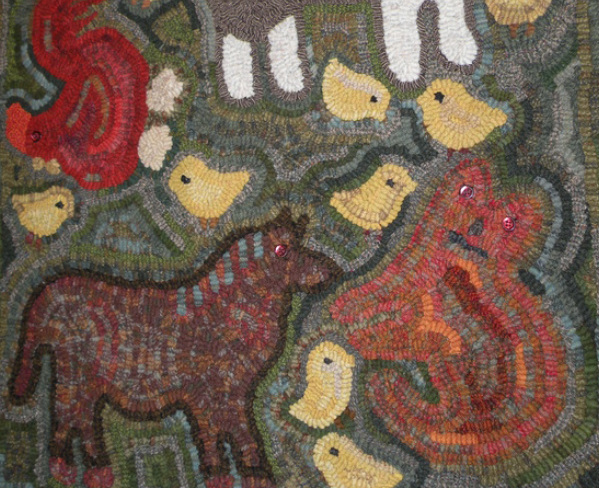 Heart in Hand Rug Hooking – Heart in Hand Rug Hooking will be featuring mola designs and tropical colored wool. An article about the mola designs was in the 2011 Nov/Dec issue of Rug Hooking magazine. There will also be a new selection of Prisms 8-value swatches useful for shading, hit-or-miss, and pictorials. A selection of original patterns and hand dyed wool will also be available. Norma Batastini is a Pennsylvania native and went to college nearby in Elizabethtown. She now lives in Glen Ridge, NJ outside of New York City. Original designs, hand dyed wool, and specialty classes are her forte. Grant Street Woolworks – Dyed wool and incidentals, punch needle supplies and patterns, snippet bags, scissor holders. dye books, etc. Dianne Pearce - Basketmaker - Hand-woven baskets for your rug hooking and home. Among the basket selections are tool baskets, divided baskets, snippet baskets, and totes. Dianne has been weaving for about 20 years and the focus of her weaving incorporates technique, color, and pattern. Fluff & Peachy Bean Designs – Hand dyed wool and silk, patterns, and supplies. Woolgatherings Rug Hooking Studio – Wools, cutters, books and supplies. Information about classes. 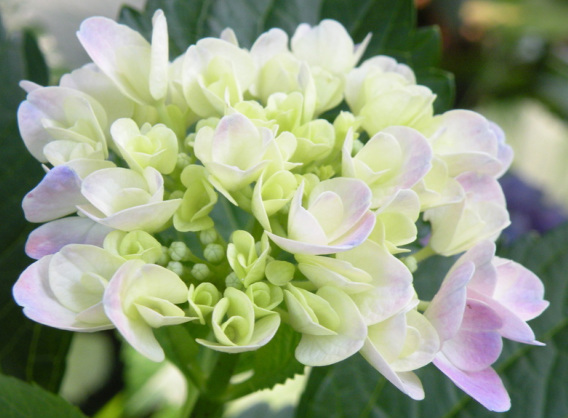 Handmaiden Designs – Quilts, rugs, punch needle, stitcheries , woolens, other gifts of the heart. The Woolwrights have received confirmation from our own Mat Swap Queen Marty that the theme of the mat swap event this year is "Americana". Let your imagination run wild and design an "Americana" mat that will be swapped for another. Your mat must be 6 x 18 inches, labeled, and following the theme of "Americana". Mats will be accepted at your arrival at the Spring Hook-In.